At Made In Nature, they’re on an adventure to discover the most flavorful, organic ingredients on the planet. So, of course, they use only real food, grown the way nature intended. And when Made In Natures paired their mouthwatering, organic dried fruits with the perfect blend of seeds, spices and just a pinch of love – well, it made for a real celebration. So go ahead and enjoy. It’s all good! 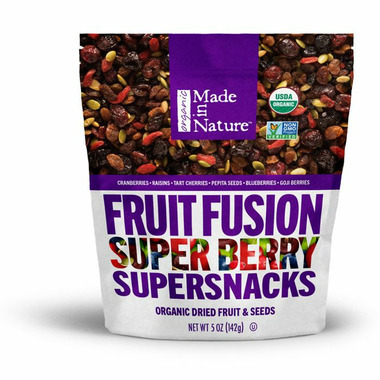 When you open a bag of Super Berry you’re in for an explosion of flavor! The organic tart cherries, blueberries, cranberries, raisins and goji berries are bursting with flavor. And nothing adds a delicious and nutritious crunch like beautiful pepita seeds. 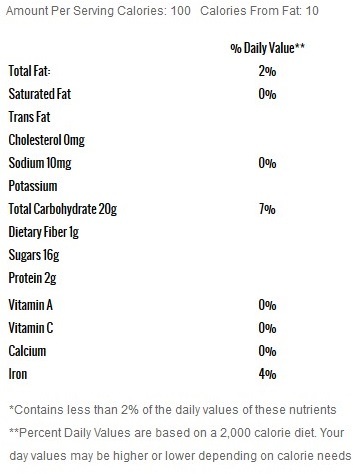 All this – and no refined sugar! That’s the Made In Nature promise. Ingredients: Organic Cranberries, Organic Raisins, Organic Tart Cherries, Organic Dry Roasted Pepitas, Organic Blueberries, Organic Goji Berries, Organic Apple Juice Concentrate, Organic Sunflower Oil. Yummy, but expensive for a small amount of fruit. This is too expensive for the amount. Similar quality product can be attained for much cheaper from different sources.